During Stylist’s Shoe Fortnight a few weeks back, we asked you to send in pictures of your most fabulous footwear for our Show us Your Shoes competition. We couldn’t have anticipated the sheer number of stylish shoe addicts amongst you – entries flooded in by their hundreds, and once Abi Silvester, editor of Shoewawa has picked her favourite pairs, we asked you to crown our ultimate shoe-wearing champion. 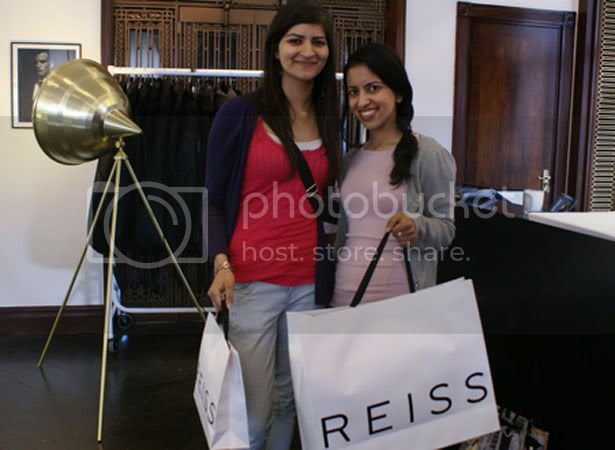 The winner – 23 year-old Londoner Roshni Radia - wowed you all with her hot pink pair of stilettos, and today (( June) she got the chance to claim her prize – a £500 shopping spree at the Reiss Regent Street store. Guided by the stylish eyes of Holly and Harry, Reiss’s personal shoppers, the self-confessed “jeans and t-shirt girls” were on the hunt for two very different looks. Roshni needed a complete wardrobe overhaul for when she returns to University to start a Masters degree, whereas some of the jumpsuits on the shop floor had caught Chandi’s eye. After much lounging on the leather sofas, several trying-on sessions and some serious strutting in the personal shopping suit, Roshni came away with a pair of slim-fit khaki trousers, a peach chiffon top and a pair of fierce leather wedges “comfy enough for wearing to lectures but cool enough for a night out” (once again she impressed us with her impeccable taste in shoes). For a series of weddings and birthday parties this summer, she settled on a white shift dress with sequinned shoulders. Harry managed to steer Chandi away from the jumpsuits, and into a navy silk dress with a nipped-in waist, with her deciding “I don’t have an occasion to wear this to, but I’ll find one!”. See all of the Show us your Shoes finalists (including Roshni's winning pair) here.